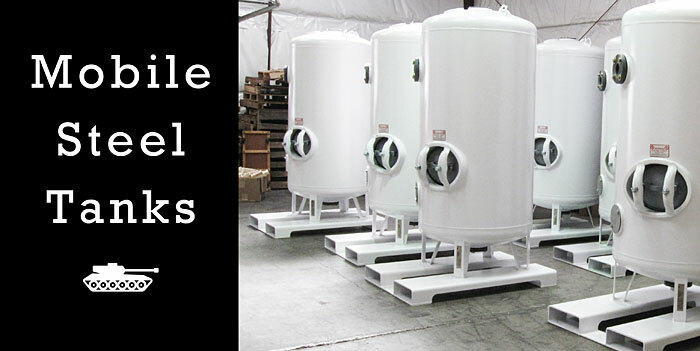 SWT's Mobile Steel Tanks are specifically designed for portable exchange applications including deionizers (PEDI), softeners (PES), and carbon filters. The rotomolded polyethylene lining is designed for exceptional durability. Scratches or cracks in the PE lining can be repaired in the field with heat, if they occur. Standard mobile steel tanks are provided with a bolted-on galvanized fork tube base. Non-code and ASME code construction are available. These portable exchange tanks provide greater flexibility than permanent systems by delivering treated water where you need it. This custom approach provides consistent water quality when resources and budgets are limited.